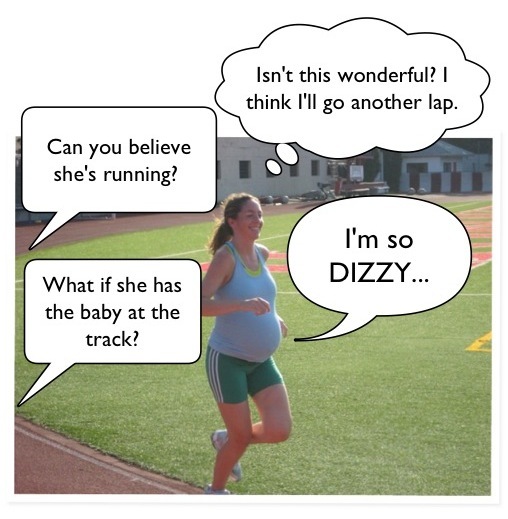 Lots of people have asked me about running while pregnant. I stopped running before it was obvious to most people that I was even pregnant, so I don't have many experiences to share. Sarah, on the other hand, ran until a few weeks before her due date with all three of her kids. Here's how she did it. When I first found out I was pregnant with my son Eamon five years ago, I hadn't a clue about what it meant to run while expecting. My doctors were pretty lukewarm to the idea, and the only research I could find was fairly negative. Still, I couldn't imagine going nearly nine months without running. So I simply kept it up as best as I could. One of the best bits of advice given to me from my doctor about exercising while pregnant was to stay consistent. “Once you stop,” she told me, “It'll be extra hard to start it back up.” And, after a week or so off of running because of the stomach flu in my second trimester, I realized exactly what she meant. Because of the constant changes and shifts going on in your body, even a few days can make a big difference in how you feel while you exercise. So if you usually workout three times a week, do your best to keep that up. The more consistent your workouts are, the better. Even if you're worried about weight gain, pregnancy isn't the right time to stress about how many calories you're burning. (Trust me, whether you're running or not, you're going to put on pounds. In my case with E, plenty of them.) Most doctors say you should keep your heart rate under 150 bpm. Others tell you that you should still be able to hold a conversation while exercising. Every body is different, so the bottom line is that you should stay in a comfortable zone where you aren't taxing yourself. The times I've pushed myself too hard - out of competition in a race or as a challenge for myself - I've felt light headed, weak, or woke up the next morning barely able to stand. Yeah, not smart. At. All. Let's face it: Our bodies just aren't built to run while we're pregnant. But, of course, that doesn't mean it's not doable. You just have to adapt to the changes and pick up a few oh-so-needed accessories. The most essential? A belly band . When I finally “popped”with E around 27 weeks, the added weight took a toll on my pelvis. But with the band wrapped snug around my hips, it provided a buffer between my protruding stomach and vulnerable pelvis, and supported my back, as well. I literally could not run without it. Although I have friends who ran until the day before they gave birth, I never lasted that long. When the aches, pains, and discomfort got to be too much, I simply stopped running and spent the last gasp of pregnancy lazying around on the couch, nesting, and doing easy workouts at the gym. If you're able to run for all 40 weeks, fab. But don't sweat it if you want to toss in the towel in your second trimester. This is your race to run, so be OK with setting your own finish line.